The six questions listed below help guide your discussion about your organization’s differentiating activities. These six questions represent two different perspectives. 1) Whom do we serve? 2) What do they want and need most? 3) What do we provide to help them? 4) What is the best way to provide this? The final two questions prompt you to think about the implications of your differentiating activities for your organization. 5) How do we know we are succeeding? 6) How should we organize to deliver? Below are the six questions applied to the Deep Thought Academy a private school described in a case study in Beyond Requirements. How should we organize to deliver? Nonprofit school with a board composed of parents; small central staff who also serve as faculty. Target 15:1 student-teacher ratio. These questions are best suited for discussions when an organization is trying to formulate or revise its strategy. Organizations ranging from small nonprofits to Fortune 500 corporations have used these questions as a way to guide strategy discussions. Your team can also use these questions to guide discussions about what your organization’s strategy actually is and whether your product aligns with that strategy. These questions place the focus on the value the organization provides to its customers. They also ensure that the organization structures itself and its efforts around that purpose, rather than getting distracted by activities that don’t promote progress toward the end goal of delivering value to customers. The six questions also drive the conversation around how to measure that progress. For internal products, the value in discussing these questions is so that your team can identify your organization’s differentiating activities based on how it actually behaves. This can be especially helpful if your team is not receiving explicit guidance from your organization’s leadership. The six questions are helpful because they emphasize the aspects of an organization’s sustainable competitive advantage, which ties into its differentiating activities. Pull a cross section of people together (the composition of the group depends on the purpose of the discussion), and guide them through the six questions. Sticky notes, fine-tipped permanent markers, flip chart paper, and flip chart markers are helpful for these discussions. You may want to identify several ideas individually, then discuss the ideas as a group in order to converge on one response, or just a few. The questions build on one another, so you want to identify the desired answer for the first question before moving on to the second. Whom do we serve? This question encourages a discussion about your organization’s target markets and market segments. You’ll want to narrow this down to a very small number—preferably three or fewer—so your activities will be focused. Discuss the following questions for each target market you identify. What do they want and need most? This question identifies the needs each target market is seeking to address. What do we provide to help them? This question identifies the products and services the organization provides to satisfy those needs. What is the best way to provide this? The answers to this question can often help identify an organization’s differentiators. How do we know we are succeeding? This question helps identify overarching organizational objectives. How should we organize to deliver? This question sparks conversation around how the organization should structure itself to most effectively satisfy the needs of the target market. These questions help identify differentiating activities in an organization. If you are working on a project that does not address something identified by these questions, that is a good indication that you are working on a parity activity. These questions focus on how your organization meets the needs of your customers. 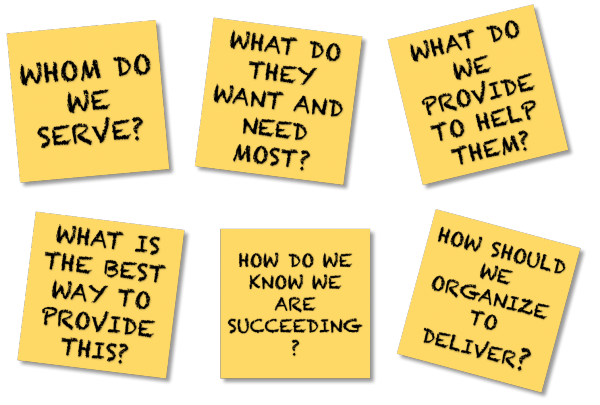 The answers to these questions are still useful for internal products because they provide a better understanding of how your internal product relates to your organization’s strategy and reminds you how your internally focused product contributes to meeting your ultimate customer’s needs. The six questions are applicable for many different perspectives in your organization. From the organization wide perspective, the answers to the questions are fairly abstract. From an external product perspective, the questions focus on your specific product offering. From an internal product perspective, you could ask these questions from the perspective of the business stakeholder that you are representing. If you shift the focus in that way, you could switch the question “What do they want and need most?” to “What problem(s) do they [your stakeholders] have that they would pay to have removed?” It’s an important shift. They may want several things, but what they really need is for a particular problem to go away. Even if they have a problem that they would like to go away, asking if they would pay to have it removed focuses even more on whether the problem is worth solving. Pixton, Pollyanna, Paul Gibson, and Niel Nickolaisen. The Agile Culture: Leading through Trust and Ownership. Addison-Wesley, 2014. If you learn better with video rather than reading, you may want to check out Analysis Techniques for Product Owners Live Lessons, a set of video training sessions that show you how to apply analysis techniques to product ownership. Lesson 3.2 focuses on the six questions.